I'm entering the MFT Card Design Superstar challenge with this card. I won't go all philosophical about being a superstar - I suspect that we all have days where we feel like superstars and days where we don't! lol! This idea came to me while I was away last weekend with my daughter. It came fully formed and I don't think I've seen it anywhere. That's a rare occurrence for me! And in the end, I think its whimsical and fun! Things With Wings - sentiments - I cut up two of them and placed them on either side of the mice for balance. Blueprints 26 - balloon, balloon string and bow. I created stencils and sponged the balloon and string to keep the panel flat for my mice. You are a superstar to me Ardyth! This is so fun and whimsical and I am laughing our loud thinking of the Queens' Guards floating up in the air with a balloon and they can't scream for help because they are on duty! This is great! Love Tracey's description, it made me lol. Super fun and so clever. Wow, what a lovely card. I love the color of this balloon togehter with the London's guard outfit :D Great idea. This is so much fun and well designed, Ardyth. I say that knowing that everything you do is 'well designed' but I wanted to stress the point. Superstar quality all the way. Yes...we are definitely looking at one of THE cards that is guaranteed to snag one of the MFT Card Design Superstar challenge awards! Love your design! 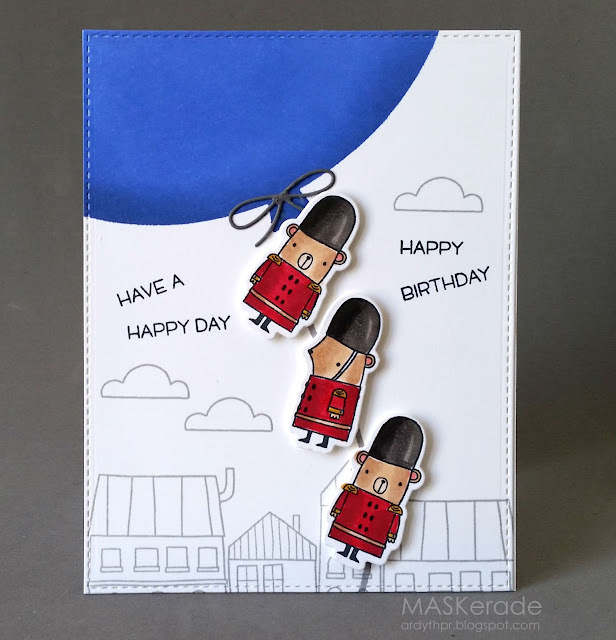 The little bear soldiers and the tilted sentiment make your card so fabulously fun! WOW! I saw this in the gallery and NEVER would have guessed it was yours! LOVE IT! This is one seriously awesome card, Ardyth! Brilliantly composed and coloured. I hope you're giving it to me! LOL! So completely adorable!!! I love how you left the background uncolored; it really highlights your characters!